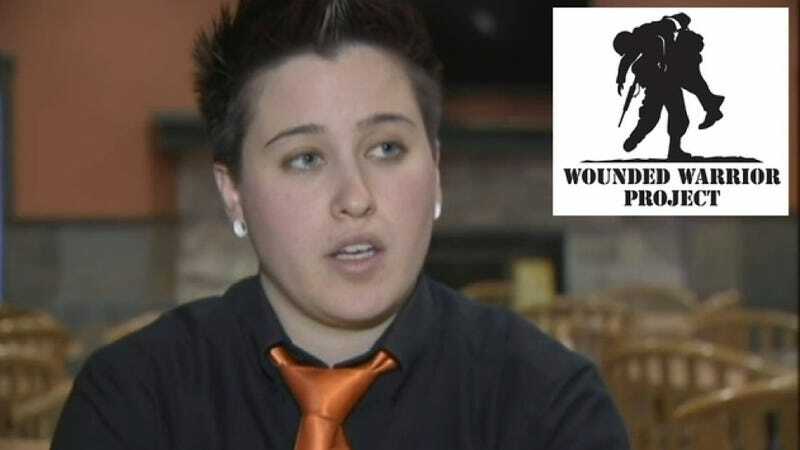 Remember our good, viral acquaintance, Dayna Morales, the Pinocchio waitress/ex-Marine from New Jersey who falsely claimed that she'd received an anti-gay message from an allegedly no-tipping couple, then began accepting donations from supporters who wanted to help wounded vets, then began allegedly hoarding that money all to herself like some kind of dragon in a mountain wreathed with mist and memories of a dwarf diaspora? Well, her streak of duplicity seems to be at an end — she's actually been returning all the donations she collected on behalf of wounded vets. After inciting an internet firestorm of outrage against a unwitting couple whose only real fault seems to be poor auditory conditioning, Morales watched as that outrage explosion ricocheted back towards her. She quickly became the compulsively-lying villain in her own viral story, with claims that she'd previously lied about having cancer and that she'd never actually served in Afghanistan (as she'd claimed) because she was dishonorably discharged from the Marines for missing drills. Now, according to NBC New York, Morales seems to be making amends under duress. After the internet freaked out this week about Morales allegedly not donating the funds she received from internet dupes eager to help wounded vets, a less-insidious motive for withholding that money became clear — Morales appears to be refunding at least some of the donations made to her PayPal account in the wake of the tipping fiasco. Even sums as little as a dollar are being returned, though NBC New York noted that the one Pleistocene-era man who mailed Morales cash hasn't yet received his refund. Also, Gallup Asian Bistro, the restaurant Morales worked at, has announced her termination on Facebook, so justice has been done, I guess. Really, the ideal ending to this strange little service industry saga would have been for Gordon Ramsay and his beautiful thicket of hair to somehow get involved and help Morales overcome her penchant for lying so she could become a great kitchen expeditor.